Amazing views and beautiful cabin. We have rented with GSCR for 5 years and love it every year! The cabin was very clean. We love the hot tub, pool table and fire pit. Excellent location. Superb facilities. We particularly enjoyed the hot tub and pool table,. The end of a grand stay, visiting our daughter who is studying at WCU. Woke up to wonderful views, spent time visiting local towns. Back to the Hot Tub and a cozy fire at night. The week long pool championship was lost by Dad. Thank you for sharing your cabin. Amazing place, exceeded our expectations!. Loved it. Have the most wonderful memories. Magical place. The cabin cleanliness was impeccable. We didnt want to leave. We enjoyed the fire pit, the pool table, the fire-place in the bedroom. Wonderful! The staff was very professional in booking, every detail was taken care of. Today is the day to say goodbye to this wonderful place. So much family time. We take with us unforgettable memories. Magically, beautiful Cloud 10. Came here for my daughters 40th birthday as she has always wanted to see the autumn leaves. Thank you for your hospitality. Until next time. We had a great time! We loved the cabin and can't wait to come back! What a blessing it has been to stay with my family in this gorgeous cabin. We greatly appreciate it. We brought our family here for our annual family vacation. The cabin could not have been more perfect for us all. It was a fantastic week filled with the most perfect weather. We are taking home with us so many memories. We can't wait to come back again. Enjoyed a wonderful week for our family vacation. Wonderful to be "unplugged". Kids had a blast. Came here with the family as out first "Official" family vacation. Such a beautiful view. Especially from the hot tub! Absolutely loved it. Has a family friendly atmosphere and we felt right at home! Best Time ever!!. We enjoyed the cabin and the amazing views. 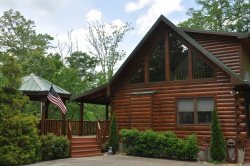 We are thankful for the owners and the care that they took with the cabin. We are looking forward to coming back. This was our first time visiting the mountains. Cabin was beautiful and spacious and scenery was amazing. This cabin had everything we needed to make our trip a very enjoyable experience. Would highly recommend Cloud 10 Mountaintop to any of our friends and family! The views from the porches were beautiful. We had a wonderful time on a family getaway to celebrate graduation. Thank you for opening your cabin. Everything was in place to meet our needs. Team was very helpful when trying to determine if the place was what we needed. Answered all questions. Our family spent the weekend here at this beautiful cabin. To celebrate a chapter ending and a new beginning. A Wonderful place to enjoy family and friends and the love between. Lots of great memories! Thank you for allowing us to enjoy/experience this beautiful place.